Information fluency is the ability to unconsciously and intuitively interpret information. Now that we are at the end of the year, I am not so surprised at my kindergartners abilities. We were studying animals (of all habitats) and classified them by land, water, and or air animals. The question about jungle animals became popular and intriguing. My students wanted to know exactly which animals do live in a jungle. Some of them were surprised to know that there are zoo animals that come from the jungle! Before we were able to gather that information, the students had a research journey! A boy remembered that we read a cool book on animals, so the class thought that this book would give all the answers to our questions about jungle animals. Once the kids looked over the book, they decided it wasn’t a good choice. They quickly commented on the cartoon-like pictures, which told them it may not be real information. Then, a girl remembered an app she used on the iPad. Once she checked out the iPad, she realized it had tons of animals and that it didn’t give information about jungle animals. After a few more books to check out, a child finally shouted, “Hey, let’s go on the internet!” This was the first time my students actually asked and needed my help, (I was impressed with the sense of solution fluency happening so far!) and so I helped them by typing on google while they watched on the SmartBoard. Since we had found so many cartoon-like pictures and books about all kinds of animals, they helped pick out the words we needed to use to search with. I displayed my best digital citizenship by making sure we had no inappropriate search results for these young eyes! My kindergarteners quickly identified the best resources online by noticing “real” photographs of animals along with text about the jungle specifically. I found it very interesting that the process of elimination of our resources ended up being based how everything “looked”. Was it pretty? Was it cartoon-like? Once we started finding real information, they were able to call it the “real deal” because they could see actual photographs that were taken, and assumed the text with it was true also. Information Fluency by definition involves a process, and I feel my students (without my direction) went through the process. They asked good questions and went through a fun series of resources to access and acquire information. Each resource found was analyzed by the students based on its “looks”…which, at 6 years old, is a good first step! They applied the information they got with each resource to help them find the next. We then assessed as a whole group the good information we found. I found it most interesting to see how they judged the resource and used their words to explain how useful or not the information would be. Such good learners I have! I think this is a very healthy and developmental stage of the learning process for this age. I was impressed with the initial demonstration of information fluency the kindergartners displayed. Teaching technology in Kindergarten has been really fun because we have wonderful options…iPads, laptops, flip cameras, etc. 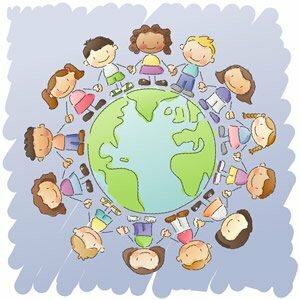 In this day in age, we know that most kids already know how to use the basic functions of these technologies. What I have found most useful though, has been treating my 6 year olds like they have not touched any of these devices before. To ensure safety with these technology mediums, we practice walking across the room and using two hands to hold iPads or laptops. We have discussions about good choices…such as, making sure our hands are clean, not using food/drinks in close proximity, and knowing the locations of the on-off buttons. Every time my students use technology, we approach it with safety in mind first. This has been extremely beneficial in building their awareness and knowledge in keeping things safe, borrowing from school’s property, and learning age-appropriate functions. We take it slow! I would highly recommend this approach until students show independent responsibility with these awesome and delicate machines! Practicing safe computer use at home is also an important aspect. This includes setting boundaries with your children on what they can explore on a device, practicing good posture while using devices, as well as developing appropriate time limits. Social Networking On Campus…On Purpose! I have heard a fair share of complaints of children (and teens, well, ages across the board) spending too much time on their phones or on gaming systems and not enough time socializing and engaging in the world around them. Now that we are in this post-modern digital age, it is almost expected that children and teens be connected to their phones, gaming systems, or other digital media. Isn’t that engaging in the world around them as well? I randomly came across an article encouraging schools to embrace this new age of technology, more specifically through Facebook and Twitter. It seems that we could have the best of both worlds in education…engagement on school campuses through digital social interaction and personal human interaction. The article is on the blog: “Not So Distant Future“, which is focused on libraries, technologies, and schools (this blog has won many awards I might add!) It offers snapshots of studies focusing on using the popular (and FREE!) Facebook and Twitter to engage students in campus events. I agree in this librarian’s take on the fact that educators/administrators worry about the use of social networking will hinder academic progress or social interactions, but should also focus on the opportunity, student reaction, student attendance, and student learning, etc. Junco, one of the researchers, has several articles published on the effects of Twitter and Facebook on many aspects of education. I think that the studies they reveal could show encouragement and motivation for our school as we have a campus blessed with involved students and many technological opportunities and advocates! 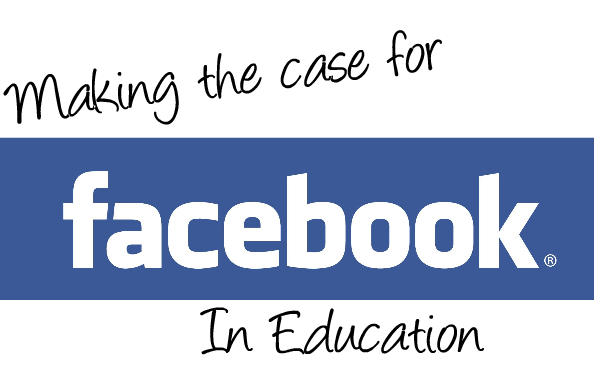 Facebook and Twitter are two of the most talked about social networks at school, work, and now on TV it seems…I think we should take a look at the success rate and think about its transition into education. It will happen whether it’s purposely used for school or if a student is updating their Facebook status under the table so the teacher won’t see. Let’s jump on board and see what we can do! Howard Gardner has got me thinking! That is what I love most about the book I chose. 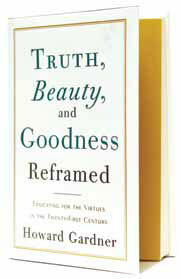 Gardner gives his personal insights and observations on three important virtues; which he beautifully separates in different chapters: truth, beauty, and goodness. These virtues are not interchangeable…something that Gardner wastes no time pointing out. In the first chapter, he draws intriguing attention to the definitions of truth, beauty, and goodness in such a way that questions the way we think we know them and can identify them in the world. This book is based off of a series of lectures Gardner made in 2008. Gardner draws attention to the challenges these virtues face in our post-modern world and the potentials of the quickly evolving digital media. For me, he had me doing some self-reflecting. I think anyone who reads this book would be drawn to think and reflect. I don’t know that everyone would agree with his opinions and definitions of the three virtues, but his smooth, fluent and even articulate writing makes it an enjoyable read. Thought provoking, right? The entire book was filled with “moments” for me. It makes me appreciate, actually, the value of e21. Not just in how great it is that we are moving forward into the digital age in a place where we are blessed with the funds and support to get there, but also in a place with people who truly care about the process. There is a lot to think about in this transition, rather evolution. It is hard to not quote the entire book, but I want to attempt to give a glimpse of each virtue. Such a common adjective beauty is…and so subjective. We do not all agree on what is beautiful, or what the term really means. Then again, do we believe in the same truths about it? Can there be any truth about beauty? Gardner’s approach on beauty was good and thought provoking; however, I would have liked a little more of something. His descriptions were a little narrow. Nevertheless, I enjoyed the direction my mind went. The final virtue of the fundamental trio is good-“or to be more precise, the Fate of the Concept of the Good in a Postmodern, Digital Era.” Gardner not only writes in a way that keeps me reflecting on concepts, but he is great about sharing how is own mind has shifted, and how his mind has traveled to these conclusions. What drew my attention to this topic is the fact that we need to think, or perhaps in some cases, re-think our perception or sense of “good”. For example, in the new era of digital communities, identities, resources, and possibilities—we need to think of ways to hold on to our sense of good in a way to maintain its relevance and need in the postmodern era. How can we all agree though or at least communicate on what good is anymore? Gardner appropriately quotes the golden rules of the era in which we’ve developed our sense of truth, beauty, and goodness…such as “Do unto others…”. He explores many ways of seeing or doing “good”, but how will we educate this for the 21st Century? To get there, atleast speaking in my own connection to Heritage Hall, I would say we do just what we have begun. I think we have done a great job finding people who care about the future and appreciate the opportunities we have to get there…who will in turn continue to research and reflect on how we are preparing our students has 21st century learners, and our teachers as 21st century teachers. How are we going to facilitate teaching and learning in such a way that when they leave Heritage Hall, they will have the skills they need for being good citizens, marketable, and employable in a world of jobs that may not have been developed yet. Moreover, how can we move forward with the “times” and technology without fast-forwarding passed precious virtues like the three in which Gardner emphasized. 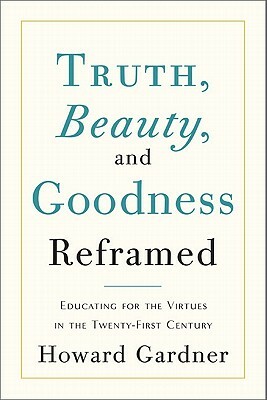 I like how Gardner titled his book: Truth, Beauty, and Goodness Reframed: Educating for the virtues in the twenty-first century. He didn’t say change them, pick new ones, only to reframe it—like altering picture frames in your house to go with new paint color…doesn’t change the value of the photo, it allows it to fit better in its environment. We are to be educating for the virtues so that we can best use our environment and our technology for the best interest of our students. My favorite tool I have used by far has been Shutterfly. Shutterfly is used in many ways! Primarily for Kindergarten, it is used by parents more than the students. Aside from e-mail, Shutterfly is my line of communication with parents. Updated weekly, our Shutterfly class website contains calendars, photos, videos, curriculum, important info/forms, and general info about our classroom and Lower School as a whole. This password protected site has been invaluable in keeping parents completely connected with what is happening in the classroom. The kids love taking pictures in class, so it is the best way for me to share them with their families. Through Shutterfly, you can order prints or photo books of the pictures you love! (fees apply via Shutterfly.com) I often receive emails raving about the website and how wonderful it is to get photo and video updates of our classroom! One of my favorite features, drum roll please….SIGN-UP SHEETS! That’s right, sign-up sheets online. It’s amazing. You don’t have to worry about posting forms outside your door or for parents to find time to sign up for various opportunities in a timely manner. Parents log-in with their own email and have complete access to sign up for volunteer opportunities, conferences, etc whenever they want! I love it and so do the parents! You can design your own class website however it suits you best. You can put as little or as much information on it. For those that don’t need a website for communicating with parents, it is a great website for kids to design their own websites. Are you a history teacher? Let’s say you have a student studying WWII. He or she could design a [free] website displaying what is learned! Within the website, he or she could have different tabs or pages titled: important battles, key figures, timelines, causes and outcomes, military strategies, etc. Within each section he/she can layout information in a variety of ways. Not to mention, other students could log-in and give feedback on what has been posted. He/she could also upload photos to help share the information. As far as I can see, there are endless possibilities with Shutterfly! It is a free website, however, should you choose to upgrade, there is a fee good for one year. This gives you more memory storage for video uploads, etc. What a great way to exemplify the fluencies of 21st century learning…creatively displaying information in such a way that engages others, sparks feedback potential, and a safe and educational way to post info on the internet. Oh the possibilities! Shutterfly, you get an A+ from our Kindergarten class! You could almost see their minds spinning! Many kids wanted to give up and say there is nothing more they could do. A few kids thought could switch their pattern and alternate the 2 colors in the other order, which technically is a new pattern. Then, one of my thinkers had an idea! I heard him say “I can use 2 reds!” This idea started to catch on and those cubes got to moving! 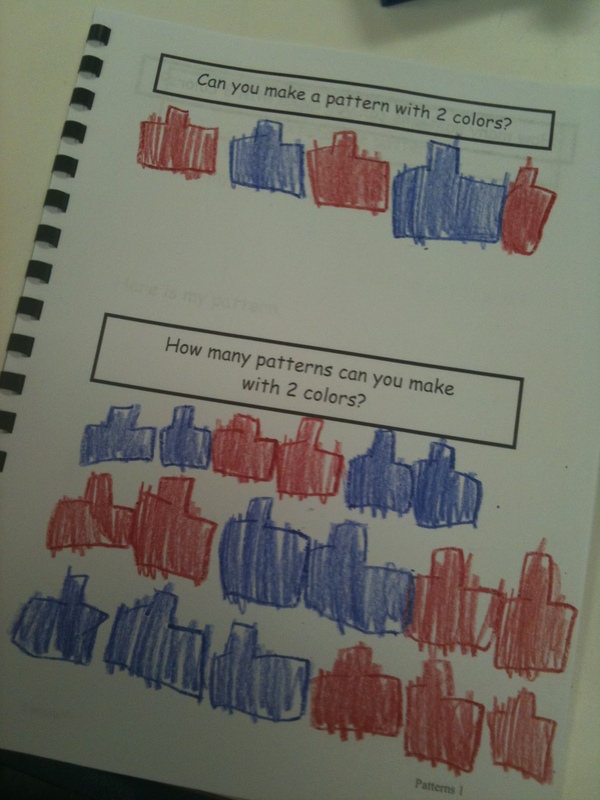 I encouraged my students to “record” their patterns on their paper so they wouldn’t forget the ideas they’ve created. Creative Fluency is “the process by which artistic proficiency adds meaning through design, art and storytelling.” I’m going to stretch it and say designing with cubes is an art form! Here’s where I feel the creative thinking really stepped in. One of my students noticed that the American Flag in our classroom has a pattern: red and white stripes. I asked, “Do any of you think there could be more patterns hiding in our room?” My students were so excited to find out. The ideas started flowing: our blue and yellow tile is layed in a pattern, the days of the week repeat over and over on our calendar, the row of “5s” on our 100s chart looks like a pattern, my shirt has stripes, the timer beeps in a pattern… The list went on and on! One girls even said, “Everyday is a pattern! You know, the sun and moon keep switching places over and over again!” Something that really struck me, was that my kids didn’t just notice color patterns, they noticed sound patterns and patterns related to their lives. This was a fun extension to patterning. To me, creative fluency is being able to “think outside the box” because when you can think differently and on your own, you can take ownership of your ideas and creations. I felt that my students showed a sense of creative fluency with this because they did not just need the initial red and blue cubes. When we out to recess, they were on the look out for outdoor patterns. While some kids noticed color patterns on the “big toy”, other kids picked up leaves and put them in a pattern. It all works for me! All I did was let them explore their interest in patterns and facilitate the discussions. Certainly for all ages, and most definitely in Kindergarten, I feel it is crucial to allow kids to think on their own, even when it sounds silly, and let them go as far as they can. This kind of thinking will hopefully turn over into the creative thinking for problem-solving. One of students last week couldn’t seal an envelope, when he saw that my tape dispenser did not have tape, he went and found a sticker to seal the envelope. I found that to be very creative thinking and he didn’t even ask for my help on how to solve his problem. My hope is that all of my students will develop this kind of thinking. Solution fluency is the ability to think creatively to solve problems in real time by clearly defining the problem, designing an appropriate solution, applying the solution then evaluating the process and the outcome. Define the problem, because you need to know exactly what you are doing before you start doing anything. Dream. Envision a future with the problem solved. I am so intrigued by this essential and complicated fluency. By definition, a fluency is something that is so mastered, it is fluent—smooth, done with ease, and done as if subconscious. Solution fluency in Kindergarten, at this point, I feel is almost non-existent. We continually work on problem-solving, but it’s as if that’s a far as we get. There is practically zero application from one problem to a similar one. Yes, kindergarten is a young age and for that I will be a little easy on them. I don’t want to overlook my classroom examples though. I will try to throw in a positive example too. These two kids somewhat discovered the problem at hand, yet could not dream of a possible future with the problem solved. Their thinking did not take them far—there was no thinking. What I have noticed is that these kids require so much affirmation and are so dependent, that their own personal thinking is not up to their full potential. I have found similar scenarios everyday. In fact, while talking with another teacher (a fourth grade teacher), we discovered we could record 50 examples a day of lack of problem-solving skills. I spent some time explaining to the Lower School teachers the 21st century fluencies and how they apply to us. I made an effort to have conversations with teachers across the school on Solution Fluency. My conversation with the fourth grade teachers struck me most. While my days in kindergarten are filled with problems like the aforementioned “marker lid” example, I found it very interesting that even in fourth grade, these situations are still occurring. I know that Solution Fluency connected to 21st Century Learning involves higher-levels of thinking and even goes as far as technology-use. However, my concern is with basic common-sense. A question/concern I have heard now repeatedly in the Lower School is: My students can’t solve problems or do any thinking…I don’t want technology to be another resource or chance for them to skip the thinking process. How can we keep technology as a useful tool, but not let it take place of thinking, especially when these kids show very little problem-solving/higher-level thinking skills as is? Many teachers came to me with examples of lack of problem solving. I would like to share a quick list, rather than diving into each one. -A fourth grader received a poster to complete her project. She noticed that her poster had a mark on it. She asked what she should do. The teacher asked, “What do you think you could do to make it work?” The child could not come up with a solution. The teacher was shocked that after turning the poster around in different ways and staring at for several minutes that the child could not think to use the back of the poster, or even try to erase or wipe-off the mark. -Two 1st graders were sharing the loft as a listening center. One child put on a headset and the other child wanted to listen to the story too. When asked what the children could do to solve the problem, one girls suggested that they take off the headphones at the end of every page and then switch. The teacher asked, “Do you think you will hear the whole story that way or just every other page?” The girls did not have a clue how to think of an alternative solution. -A fourth grade teacher purposely prints extra spelling lists, important notes for the week, etc and posts them on the wall at the front of the room. She has done this since the first week of school. A boy-in the 2nd week of November-said that he can’t find his spelling list and grows upset and confused. The teacher said, “Well, what can you do about it?” The boy grew frustrated and couldn’t think of a solution. She reminded him to “look around the room for clues, like we always do”. The boy did not figure out that the extra lists on the board were available until someone directed him there. Apparently, that was the fourth kid in one month with the same problem. I want to emphasize that these are not examples from the same kids over and over. If I listed all the examples of poor solution fluency, you would need a whole day or two to read them. My point: Solution Fluency is essential. What can we do to improve on this? In our last e21 meeting, I recall teachers commenting on 9th graders inability to find solutions in simply logging into email and other various simple computer skills. I have found that these kids need affirmation. Affirmation for turning their paper in the right spot, affirmation in that the child wrote in his/her agenda correctly, affirmation that he walked in the hall nicely, or affirmation that he cleaned up his own mess. These kids are so dependent on others, that I believe Solution Fluency will be our biggest challenge. I don’t think it is impossible, but I think it will be difficult to completely let go and let kids do the discovery, dreaming, and designing of solutions. My concern has become how the students’ home lives are connected to their ability at school. Many parents are so caught up in wanting their child to be successful that they are doing a disservice by doing too much for them. Other parents are busy and find it easier to just do it for them rather than allow a teaching moment. These kids need to grow independence. While I know in the middle and upper school there will be a different response to this fluency, I felt strongly about pointing out the serious need for solution fluency. I am very anxious to hear how other e21 members will address this fluency. I am simply addressing it as it came to me in my environment, the Lower School. Researching this fluency has been an enlightening eye-opener for me. I will say that now this is on my mind, I am doing my best to allow for opportunities in my classroom to witness this fluency in action. In kindergarten, it takes patience. These five and six year olds need time to process the fact that there is a problem and that they are capable of finding their own solution. A positive example of good problem-solving in the classroom would be from the second week of November. We were on the playground when some of my students smelled smoke. The girls couldn’t see any smoke and really wanted me, the teacher, to tell them where it was coming from. I said, “I don’t see the smoke either. Do you think I know where it is coming from?” The girls figured out that I didn’t know either and rather quickly, one girls shouted, “Let’s go to the top of the playground toy and see if we can see it from up high!” I was elated that someone in my class would have dreamed of the possibility and designed a potential solution, and so quickly! She delivered the goods by sharing it with her friends and leading the way to the top! After they looked around the skyline for smoke, the girls unknowingly debriefed the situation—they evaluated that they were not high enough to see the smoke or that there were too many buildings in the way. How the teachers in the Lower School feel about Solution Fluency and how the teachers facilitate healthy problem-solving methods will most certainly affect how these kids enter the more “independent world” of middle school. Let alone, their ability to survive and thrive in the Upper School with the ability to use the Six D’s, and better yet, leave Heritage Hall with the confidence and fluency in finding creative solutions in the real world. We want these kids to leave Heritage Hall and be marketable, employable, and good citizens—we can’t expect much out of these kids if they are still dependent, desiring affirmation in all that they do, or struggling with dreaming a possible solution to a problem. It all starts in the Lower School! How these kids see and attack problems at school and at home as young kids will definitely shape their experience and future designs of problem solving. There is a lot of teaching and learning to do as teachers. How can we help facilitate and encourage Solution Fluency without doing too much? We have to allow kids to discover and dream up creative possibilities on their own. How will Heritage Hall going 1:1 affect the students’ acquisition of the fluencies? iPad Use…Too Much Screen Time for Kids? I came across this article about Kindergartners in Maine getting ipads. As a kindergarten teacher, I obviously found it interesting. While I am ANXIOUSLY awaiting the ipads for our classroom, I was still intrigued by a comment in the article. The potential concern is: how will too much screen time affect our kids? Now, on one hand I know that we will use the ipads often, but certainly not all day, so will it really make a difference? On the other hand, ipads are brand new and we really don’t know how these kids will be in 10 years! Interesting!